Thank You, Memphis. Thank You, Very Much! I can’t recall not one resident of Memphis who didn’t ooze joy and kindness. Maybe it’s all of the trolley and horse carriage rides; the finger lickin’ Southern cookin’; or maybe it’s the whiskey and live Blues? 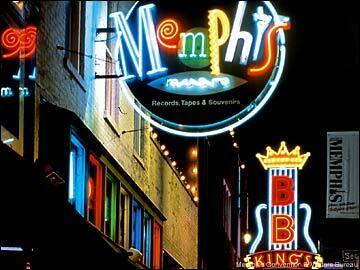 All I know for sure, is there is something in the air that welcomes you to Memphis and makes you feel right at home. After walking street after street of empty downtown offices, stores, restaurants and lofts, however, you clearly see how deeply affected the city is by the recent recession. Is it really over as the papers claim? Not according to Memphis streets. This bittersweet experience… full yet empty; magical yet powerless; vibrant yet dim…made us all feel like this trip was more important than the others. We were a part, if only for a few days, of offering a helping hand to a still challenged economy with so much to offer– a local musician a chance to shine, a chef a stage for his delectable creations, a “home free” man a chance to pretend he is the incarnate King of Rock. We walked, we danced, we dined (a lot! ), we pampered ourselves. But our trip was more than just about us, it was an even exchange of much-needed mojo! So, this is a simple and short blog to simply say “thanks,” to Elvis Presley for WOWing me again, to my childhood girlfriends for loving me, and to Memphis for inspiring me! So, on this morning I begin as they recommend, with some eggs, bacon, toast and coffee (Oh, but how I miss the biscuits, shrimp & grits! ), and my vision of a cloud of positive energy and light surrounding the City of Memphis for being authentic, passionate, and welcoming. Hi Monique! I think it’s great you ladies take the time to do this every year! Thanks for sharing! Very inspirational!